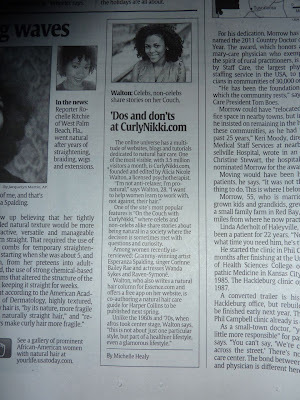 Guess who got a little profile in the paper today? USA Today... tomorrow, the world! Check out the online celeb gallery! I'm so impressed! Congrats Nikki! I'm very proud of you and so happy to be apart of the movement. Work Nikki Twerk Nikki! So proud of you diva! Keep inspiring! Cheers to you Nikki! Much deserved ... You truly serve as the standard when it comes to fostering a natural hair community. I appreciate being a part of this community ... Let's keep it going! Go NikNik it's your birthday! Congrads! Nik you're highly favored! You deserve this! That is really great! I'm so happy for you! 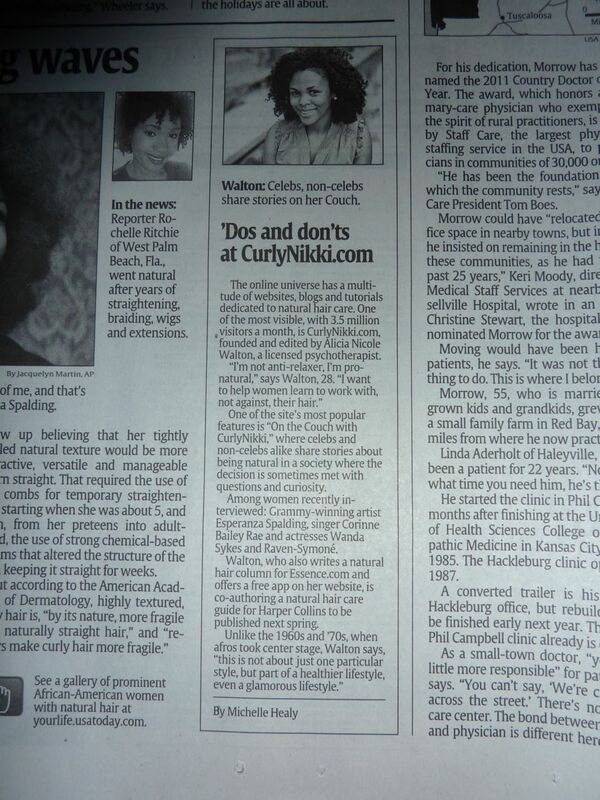 Of all the verbiage in the article, this statement is the one that put me on my feet........" co-authoring a natural hair care guide for Harper Collins to be published next spring". Nik, you have been very, very busy! I can hardly wait to get my hands on the guide (autographed copy, please). Congrats again - 2012 will be a great year and I am proud to be a part of the journey! Congratulations Nikki! You are awesome. This has nothing to do with the awesomeness of Nikki but...to be kind of negative... "More black women "comb out" chemicals" --wtf? A little more research please. Congratulations on your recognition! 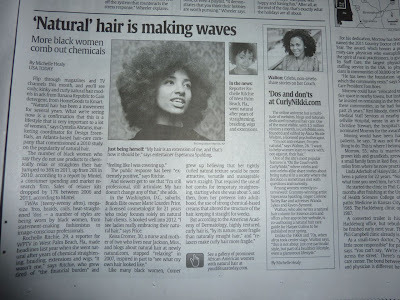 I am so glad that natural hair is being embraced more and more each day! When I first started on this journey there were so few naturals, but now we are growing in numbers and I feel this is how it should be! Thanks to pioneers like you, more naturals are better informed and reaping the benefits of growing acceptance of their natural locks! I am thrilled beyond words! Go on girl! I see you! Go head, Forehead!!!! That is awesome! You're everywhere lady! 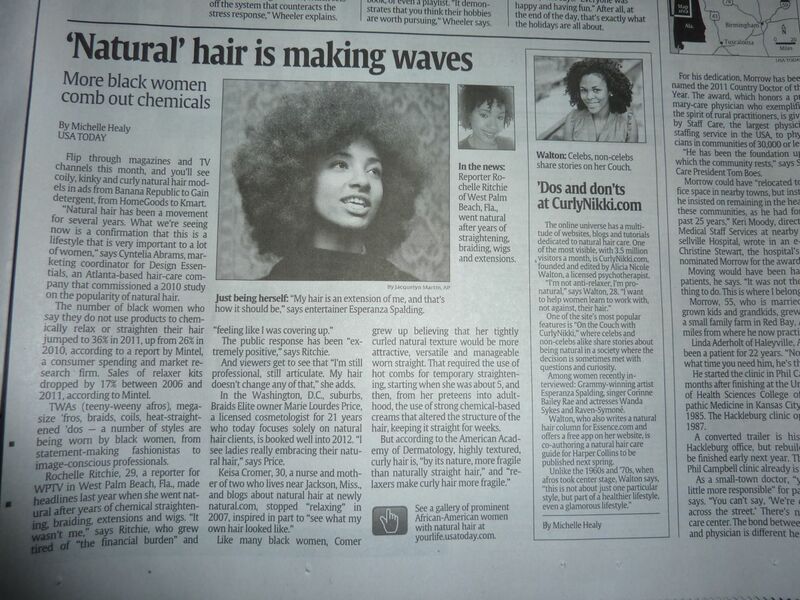 Thanks for continuing to highlight and lift up us natural ladies! Stay blessed! WOW! congrats! This is so wonderful! Unfortunately there are some ignorant people making bad comments on the website. Thank God I'm secure!!! OMG....As soon as I saw this post I was like "What??? I gotta see this myself" So on to the community office newspaper pile and I was beyond excited to see your piece in the paper. Congratulations and many blessings to you on future endeavors!!! I'm so happy I found you and your website Nikki. I'm not sure what my hair would look like if I hadn't stumbled upon this website. I probably would have just given up and gone back to relaxers because I thought it was easier. Oh my damn! You betta werk Nik! So proud of you and I want an autographed copy! JUMPING on the page all proud!!! Woot Woot! Go Nikki go! Can I have your autograph Ma'am? 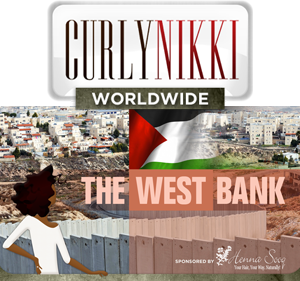 Go head Nikki girl....this site is so inspiring keep up the fantastic work!! CONGRATULATIONS! That is wonderful. I've read your blog for years and I've learned a lot from you and your contributors. The recognition is richly deserved!! Congrats Nikki! There are really some great leaders in the natural hair community and you are certainly one of them! I noticed several people saying that natural hair is great because you can wear it curly or straight, sometimes in the same day. I will probably never straighten my hair again. I got is flat ironed to get a trim and there is a big section that won't curl back up anymore. So proud. I went natural in 2004 and haven't looked back. The only problem I have run into is, being a military spouse and moving often, if finding hair care professionals in the small, backwards places we end up, lol. I always share this site with friends and family and even strangers. Congratulations Nikki!!! I am soo happy for you!!! I am a current transitioner and I have gone 4 months without a relaxer and I will continue to grow out my natural hair, until I reached my length goal to big chop. I love your site!!! Thanks for all the inspirational photos of natural hair women as well as your own photos/videos and all the information that you provide to help me stay up to date on the best products to use and daily up keep for my hair. CONGRATS!! What a great honor! Congrats Nikki, that's huge! but more importantly, i'm loving that french roll on you! Fantasic! I'm definitely going to pick up a copy. I've been saying you should write a book! Your story telling abilities are amazing! You'd think I was in the paper! This is great news Nikki, congratulations! they better ride that wave....Congrats Nikki!! why did the person who wrote the article put the word natural in quotaion marks? woot woot! i will tip my pinot grigio to you tonight in celebration! you deserve it! i remember all your insightful, helpful posts on nc to day 1 on cn to Tyra to Essence to celebs to NOW....big things poppin! this is so awesome! very proud of you, however more appreciative of your dedication to your site. thank you for your tireless efforts. You are my inspiration Nikki! Watching you these years and your writing style blossom has been amazing. I wish you continued success! You are doing it up ... you've a had a fantastic year! Check you out!! I love it! Congrats!! Congratulations, Nikki!! I'm so proud of you, go girl! Thank you for being an inspiration and for all your hard work, you are so appreciated! Congrats Nikki!!! Loved the article! Go Nikki Go! So proud of you!! I got my copy this morning! Congrats Nikki! Thanks to you for all your hard work. I know without this site I never would've been able to go natural. You and everyone I've met on CN helped so much and made things much easier for me. It makes me proud to see the recognition of such a wonderful community. CN's going big time! I'm so happy to be part of the growing group of people who are putting away the chemicals and letting our natural hair shine. I'm excited to see you've got a book coming. I'll definitely be buying it. Congratulations Nikki and thanks for such a wonderful forum. Although, I have decided to wear my straight for now the information I learned from your has no price. No matter how I decide to wear my I now have the tools to maintain my hair. Again, congratulation and thanks!!! Get it Nikki Boo:) Congrats, that's awesome! 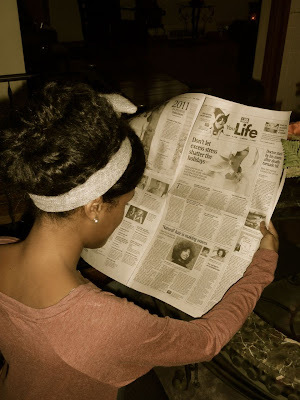 Btw, how did you achieve that colossal, lovely bun thingy in the pic where you are holding the newspaper?!? Wow! That is so awesome. Wishing you much continued success. You deserve it girl. Go go go Nikster:)!! You are blowing up lady!! If I've said it once, I've said it a million times ... but, I want to be like you when I grow up;)!! In all seriousness, you are so deserving of the publicity and accolades and your kindness and humility, as well as your desire to elevate us all, will surely take you to even greater heights! Continued success!! Not surprised! Congratulations!!!! You've come a long way! 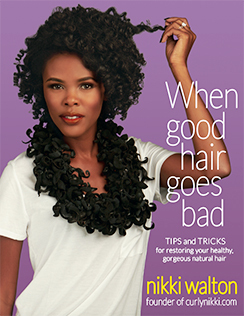 I was actually shocked and surprised to see you and naturallycurly.com mentioned in my E-Commerce book! I actually wrote a paper on natural hair for my final project (working on my masters). Thank you for everything that you do and I wish you luck on your book. OMG i bet you NEVER imagined your site becoming this big! I am super proud of you and congrats!! 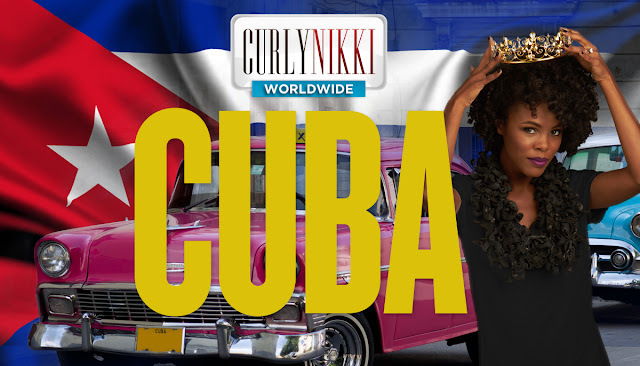 GO 'HEAD, GO 'HEAD...Nikki---CONGRATS! New hair access looking good! CONGRATS NIKKI!! WAY 2 GO!!! DO YOUR THING GIRL! HATERS FALL BACK!!! You're doing the dang on thing Nikki, we're so proud of you! Keep it up! Congrats! This is really awesome!